The Sanssouci Spa Resort Karlovy Vary is located within the center of the village and is close to some of the most popular tourist attractions. Aside from the hot springs themselves, attractions within the city include the church of St. Mary Magdalene and the Colonade which is very close to this Karlovy Vary hotel. 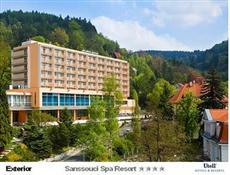 The Sanssouci Spa Resort Karlovy Vary and Karlovy Vary are located approximately 60 miles from Prague. The rooms at the Sanssouci Spa Resort Karlovy Vary are universally provided with balconies or terraces. Each of the rooms also includes amenities such as satellite television service, direct-dial telephone service with international calling and a minibar. The Sanssouci Spa Resort Karlovy Vary has extensive health and wellness facilities including 10 medical doctors who are employed as regular staff of the hotel and who oversee the treatments. The doctors are multilingual. Other facilities at this hotel include three separate restaurants and two bars where guests can go to relax over a drink. There is Internet connectivity available in the hotel at large.